Try this easy-to-do arts and crafts project. Do you have a tree in your backyard near a window? Building a bird feeder is a fun way to attract birds to your home so you can look and them and they can get something to eat. If it gets cold in the winter where you live, we're sure the birds will appreciate the meal. Since this project involves paint and a knife, we suggest that it is completed under adult supervision. 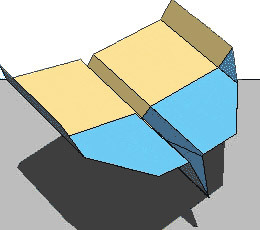 All you need is an 8 1/2" by 11" sheet of paper and these step-by-step instructions! Step 1: Wash and dry the milk carton carefully. It needs to be dry so the paint will stick to it. 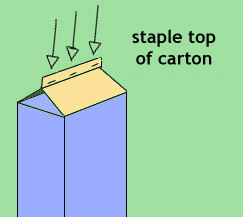 Step 2: Staple the top of the milk carton closed along the edge of the top of the carton with 3 staples. 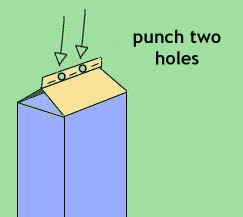 Step 3: Punch two holes in the top of the milk carton between the staples. 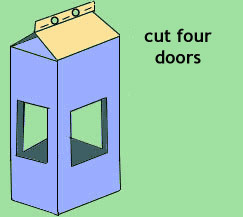 Step 4: Carefully cut four doors in the sides of the carton so the bottoms of the doors are a couple inches from the bottom of the carton. 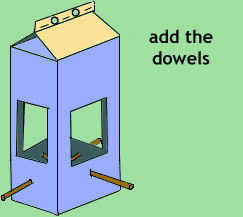 Step 5: Carefully make holes below the doors and push your wooden dowels through to make places for the birds to perch on while they are eating. Step 6: Paint your bird feeder and allow it to dry fully. Step 7: Pull your twine or strong string through the holes you punched in the top, leaving enough twine to tie the feeder to a branch of a tree. Step 8: Fill the bottom of the feeder with your wild bird feed and tie the feeder up in a branch. When you tie the feeder to a branch make it hang low enough that the feeder doesn't rub against the tree but not so low that the feeder will swing around too much in the wind. You're done! Enjoy watching the birds.